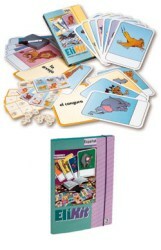 Bingo and other teaching games and activities designed to develop the four language abilities. Each flashcard and playing card has a bright picture on one side and the corresponding vocabulary word spelled out on the other. Plastic coating allows for writing and wiping words and illustrations. The Teacher's Guide contains suggestions for learning games and activities.